'Foreigners are taking our jobs' Jump to media player Shops in South Africa have been attacked and looted in east Johannesburg in a series of xenophobic attacks. Xenophobic violence in South Africa Jump to media player Violence against foreigners in South Africa is spreading as several countries arrange to repatriate their citizens. Violent attacks on Durban immigrants Jump to media player Milton Nkosi reports from a makeshift refugee camp in Durban, South Africa, as foreign nationals flee their homes after violent attacks. 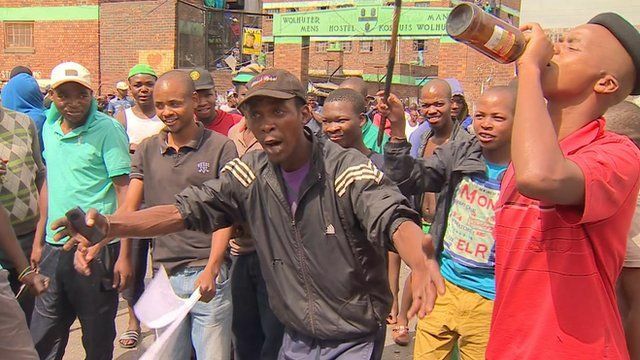 'I closed my shop on police advice' Jump to media player Sharif Danis, a shopkeeper from Nigeria, tells the BBC's Milton Nkosi how the threat of mob attacks forced him to close down his business in Johannesburg, South Africa. South Africa's appetite for fast food Jump to media player The fast food industry is rapidly establishing itself across Africa, as Lerato Mbele reports. Chaos in S Africa parliament Jump to media player Scuffles break out in South Africa's parliament following a protest during President Jacob Zuma's annual State of the Nation speech. Migrants live in fear after SA attacks Jump to media player Xenophobic attacks by South Africans against fellow African migrants have been continuing in Durban. Shops have been attacked and looted in east Johannesburg, South Africa, following a series of attacks against immigrants in the country. Police continue to monitor isolated incidences of xenophobic violence in the city. This follows a week of violence which claimed the lives of five people in coastal city of Durban. Migrants from other African states and Asia are being accused of taking jobs away from South Africans. Milton Nkosi reports from Jeppestown in Johannesburg.